Gayanilo, F.C.Jr. ; Sparre, P.; Pauly, D.
Revised version. Rome, FAO. 2005. 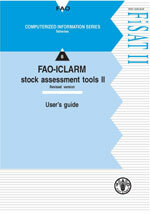 168 p.
FiSAT II is a program package consisting of methodologies for use with computers, enabling users to formulate some management options for fisheries, especially in data-sparse, tropical contexts. The FiSAT II was developed for computers running on Microsoft Windows operating systems. The new version utilizes the standard Windows graphic user interface. FiSAT II was developed mainly for the analysis of lengthfrequency data, but also enables related analyses, of size-atage, catch-at-age, selection and others.